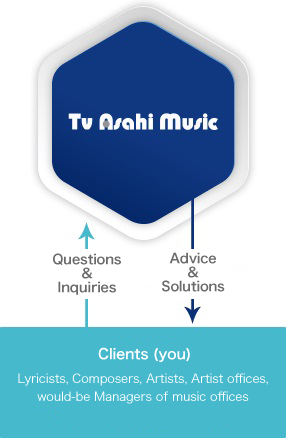 Music Publishing ＆ Consulting Services｜TV ASAHI MUSIC CO., LTD.
TV ASAHI MUSIC provides Music Publishing and Management Consulting Services. Management work of Music’s Copyright has been becoming more important to protect and make best-use of Writers’ Copyright work in the changing world of entertainment businesses. However, the actual work to protect and make effective use of Music’s Copyright is a hard task due to its detailed and complicated characteristics. Based on our massive experience and on your behalf, we will maintain overall Copyright management work of your Music, including registration of your Music at Copyright societies, signing contracts, distributing royalties and licensing your Music Rights for extensive usage. 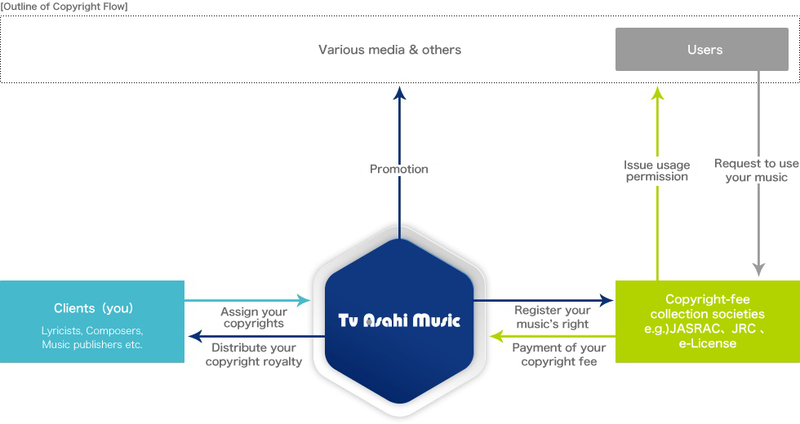 Having experienced in Music Copyright and entertainment businesses, TV ASAHI MUSIC provides Various Advices and Consulting Services such as on Music’s Copyright, neighboring Rights, and entertainment businesses on the whole. Also, if you are planning to set up a Music Publishing Company or an Artist-Management Office and/ or having troubles in business management, we can be of your help to provide the most appropriate advices and choices.